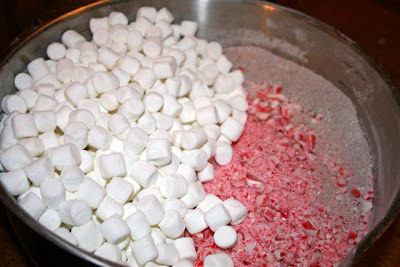 Last night the children and I made our St. Nicholas Hot Cocoa! UPDATE: I too had a hard time finding more jars and lids locally, but I was able to find them online at Amazon. Here is a link to the lids , and here is the link to some wide mouth jars (mine were a variety of brands -- both Ball and Kerr). I hope that helps! Happy Feast of St. Nicholas to you all! Looks like fun Jessica! Love the hats on your kids! We will have to do this next year. Thanks Angela! 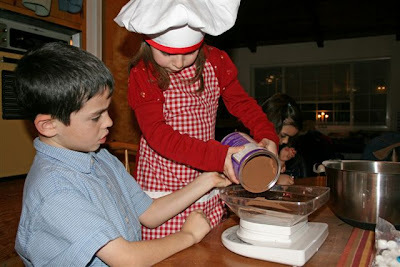 My kids *love* their chef hats and aprons! :) Every time they help me in the kitchen, they run and grab them! oooo, those look beautiful. 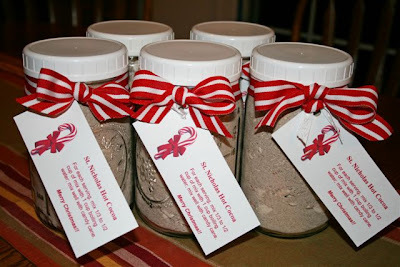 Can you share where you found such lovely jars? I'm looking for some for gifts as well! 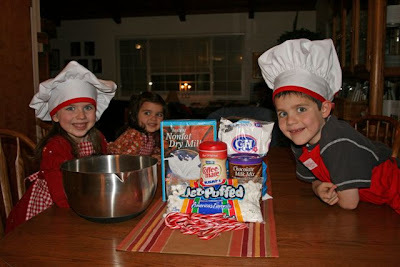 Jessica, what a wonderful idea for the children to make St. Nicholas Hot Cocoa! 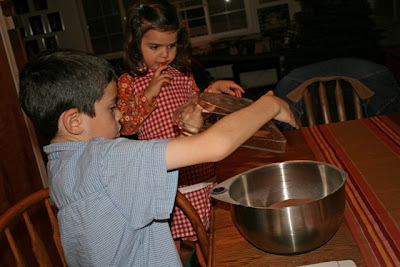 I blogged about your suggestion and think it will be a great Montessori practical life idea to try. Thanks for sharing your lovely day! I love this idea!!! I have to comment that I have the same blue measuring cups!! Oh yummy!! That looks fabulous... and fun! What a great kitchen crew! They look like they are having so much fun. Hi ladies! I was able to find some of the plastic caps to fit on the wide-mouth mason jars at one of my local Ace Hardware stores for $4.29/pkg. of 8. You might want to call your area hardware stores and ask if they have some available. We are doing this for Christmas gifts. I found cinnamon candy canes. I can't wait to try it. I found the cutest little Christmas buckets with lids at the Dollar store. I'm off to start right now!